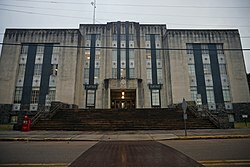 The Warren County Courthouse in Vicksburg was built c. 1940. It is located across from the Old Courthouse Museum. Warren County is a county located in the U.S. state of Mississippi. As of the 2010 census, the population was 48,773. Its county seat is Vicksburg. Created by legislative act of 22 December 1809, Warren County is named for American Revolutionary War officer Joseph Warren. Part of the Mississippi Delta and the historic cotton culture, Warren County is included in the Vicksburg, MS Micropolitan Statistical Area, which is also included in the Jackson-Vicksburg-Brookhaven, MS Combined Statistical Area. According to the U.S. Census Bureau, the county has a total area of 619 square miles (1,600 km2), of which 589 square miles (1,530 km2) is land and 30 square miles (78 km2) (4.9%) is water. As of the 2010 United States Census, there were 48,773 people residing in the county. 50.3% were White, 47.0% Black or African American, 0.8% Asian, 0.3% Native American, 0.7% of some other race and 0.9% of two or more races. 1.8% were Hispanic or Latino (of any race). As of the census of 2000, there were 49,644 people, 18,756 households, and 13,222 families residing in the county. The population density was 85 people per square mile (33/km²). There were 20,789 housing units at an average density of 35 per square mile (14/km²). The racial makeup of the county was 54.97% White, 43.19% Black or African American, 0.23% Native American, 0.62% Asian, 0.02% Pacific Islander, 0.33% from other races, and 0.66% from two or more races. 1.04% of the population were Hispanic or Latino of any race. 2005 census estimates based on the American Community Survey suggested that non-Hispanic whites were 51.5% of Warren County's population. Warren County was the only county in Mississippi along the Mississippi River, in addition to Desoto, where whites made up a majority of the population. African Americans were 46.0% of the county's population. People identifying as of two or more races were 0.6%, less than in the previous ACS. The Latino population was 1.2% of the total for the county. In 2000 there were 18,756 households out of which 35.60% had children under the age of 18 living with them, 46.80% were married couples living together, 19.10% had a female householder with no husband present, and 29.50% were non-families. 25.80% of all households were made up of individuals and 9.70% had someone living alone who was 65 years of age or older. The average household size was 2.61 and the average family size was 3.14. 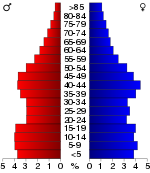 In the county, the population was spread out with 28.50% under the age of 18, 9.10% from 18 to 24, 28.40% from 25 to 44, 22.40% from 45 to 64, and 11.70% who were 65 years of age or older. The median age was 35 years. For every 100 females there were 88.30 males. For every 100 females age 18 and over, there were 84.40 males. The median income for a household in the county was $35,056, and the median income for a family was $41,706. Males had a median income of $33,566 versus $21,975 for females. The per capita income for the county was $17,527. About 15.00% of families and 18.70% of the population were below the poverty line, including 27.80% of those under age 18 and 16.20% of those age 65 or over. Warren County has the seventh highest per capita income in the State of Mississippi. Members are elected from each of the five supervisory districts. The Board of Supervisors guides and establishes policies for the county government. Members of the board of make decisions regarding economic development, public health and welfare and county roads. In 2004, Republican George W. Bush won Warren County with 57% percent of the vote to Democrat John Kerry's 41%. In 2008, however, the results were much closer based in part on a strong Democratic voter registration campaign. Republican John McCain defeated Democrat Barack Obama 51% to 48%. In 2012, Barack Obama won the county 50% to Mitt Romney's 49%, the first Democratic presidential candidate to take the county since 1960. The previous Democratic dominance was based on membership in the party by conservative whites, at a time when most blacks were excluded from voting. Since the late 20th century and passage of civil rights legislation, most conservative whites have shifted into the Republican Party. African Americans have largely supported local and national Democratic candidates since that period. The Warren County sheriff's department is located in an annex building across from the courthouse. The Warren County Board of Supervisors meets in this mall building in Vicksburg. Old Courthouse Museum, also known as the Eva W. Davis Memorial is located in Vicksburg across the street from the 1940 courthouse. ^ Leip, David. "Dave Leip's Atlas of U.S. Presidential Elections". uselectionatlas.org. Retrieved 2018-05-10.